Who buried the sovereigns and ducatoons in High Ackworth? And what is the story of the golden ring found with them, inscribed:'When this you see, remember me'? There's a lot going off in Wakefield at the moment, in spite of hard times, with the Hepworth Wakefield doing consistently well, the Trinity Walk shopping centre adding commercial life and now a newly reorganised museum for the city. This last, along with its sister centre at Pontefract, is energising local young people – it's included in the Young Archaeologists' Club annual pass and has just had its first school group in. It's also timely for the sort of appeal which appeals to the youthful of any age: a mysterious hoard of treasure has been found at Ackworth and Wakefield council needs £5,500 to help keep it in the district. 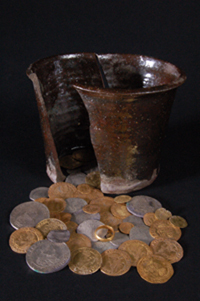 Who was the fugitive or thief who took a brown clay pot, made locally in Wrenthorpe, and stashed it with 591 gold and silver coins before burying it, probably at the height of the English Civil War? The coins were found by Dr Owen Johnson, 53, who works at Pinderfields hospital in Wakefield and was gardening when he spotted the crock, tugged at it gently and out spilled the money "like coins from a slot machine." As with all the best secret treasure, it had evaded earlier searches of the family's garden in High Ackworth, when Johnson's three daughters, who are now 22, 21 and 17, were small and used to hunt for gold. The hoard's face value in the mid-1640s when it was probably hidden by Royalists who were gradually forced out of the area by Oliver Cromwell's troops, was £85 and 12 shillings which would have been enough to employ a Civil War soldier for five years at the then rate of ten pence a day. In modern terms, it is difficult to make a comparison because the various tables from the retail price index to economic power give wildly different results; but in practical terms such as the soldier example, you could settle at £200,000. As well as the coins, which include marvellously-named silver ducatoons from the 17th century Netherlands, the treasure includes a single gold ring with the poignant inscription: 'When this you see, Remember me.' To allow the people of Wakefield both to see and remember, the city needs a total of £54,500 to buy the hoard under Treasure Trove rules. Ring, coins and pot will then go on display in Pontefract museum which is particularly good and housed in a lovely Arts and Crafts building. Grants and funding now leave only the £5,500 to raise, which is at least the sort of sum which sounds in reach. If you can add your bit to the bazaars, carboots and other money-raising activities under way, it would be much appreciated. The earliest coin is a gold half sovereign of Edward VI minted in 1547-9, and the latest are Charles I silver coins minted in 1645-6. Most of the coins are English coins of Elizabeth I, James I and Charles I. The Hoard also includes a few Scottish and Irish coins, and the ducatoons from the Spanish Netherlands. These are unusual and linked to the Royalist areas, such as Yorkshire, in the Civil War. They are especially associated with the Queen who raised funds on the Continent. She returned to Yorkshire in 1643 and is known to have visited Pontefract Castle then. Hoards of coins from the Civil War are not unusual as these were turbulent times but the face value of these is very high and makes them one of the largest found in Yorkshire. They really are an attractive assemblage, and the addition of the gold posy ring in the hoard makes it all the more interesting (without a maker's mark, these rings can be tricky to date, but its association with the coins means that we have a more reliable terminus post quem).